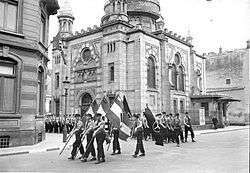 Before the war, Luxembourg had a population of about 3,500 Jews, many of them newly arrived in the country to escape persecution in Germany. The Nuremberg Laws, which had applied in Germany since 1935, were enforced in Luxembourg from September 1940 and Jews were encouraged to leave the country for Vichy France. Emigration was forbidden in October 1941, but not before nearly 2,500 had fled. In practice they were little better off in Vichy France, and many of those who left were later deported and killed. From September 1941, all Jews in Luxembourg were forced to wear the yellow Star of David badge to identify them. 1 2 3 4 5 6 "Luxembourg". United States Holocaust Memorial Museum. Retrieved 11 May 2013. 1 2 "The Destruction of the Jews of Luxembourg". Holocaust Education and Archive Research Team. Retrieved 11 May 2013. ↑ "Commémoration de la Shoah au Luxembourg". Government.lu. 3 July 2005. Retrieved 11 May 2013. Artuso, Vincent (October 2012). "Des excuses, mais au nom de qui? L'administration luxembourgeoise et la Shoah". Forum (322): 9–11. Cerf, Paul. L'étoile juive au Luxembourg. Luxembourg: Editions RTL, 1986. Clesse, René (1991). "Die Natur is gnädiger als die Menschen". Ons Stad. 36: 22–25. Clesse, René (2002). "Shoah in Luxemburg". Ons Stad. 71: 18–19. Hoffmann, Serge (1996). "Luxemburg - Asyl und Gastfreundschaft in einem kleinen Land". In Benz, Wolfgang; Wetzel, Juliane. Solidarität und Hilfe für Juden während der NS-Zeit. Regionalstudien I: Polen, Rumänien, Griechenland, Luxemburg, Norwegen, Schweiz. Berlin: Metropol-Verl. pp. 187–204. ISBN 9783926893437. Wikimedia Commons has media related to The Holocaust in Luxembourg.